This section is meant to aid when troubleshooting VST Connect. Usually, an 'Empty' project and 'Create VST Connect' should get you up and going immediately. If it doesn't, this guide may help to find out why. Of course, we assume that you have read the manual in the first place. Go to menu Studio/Audio Connections - in earlier versions, that was Devices/VST Connections, not to be confused with "VST Connect". Look here if you cannot hear the Performers' signal. In order for you to hear the Performer at any time, make sure that you are using the Control Room Monitor outputs instead of the main output. Save it to some preset (e.g. 'Stereo Not Connected') for later reference. But now I don't hear anything anymore? Let's stay here for a while. Of course, the 'Control Room' button on the top must be activated (blue). There should be a 'Talkback' channel so that the Performer can hear you. We'll talk about that later. For a quick start, your hardware 'Audio Device' and TB mic port should be assigned here to 'Device Port'. 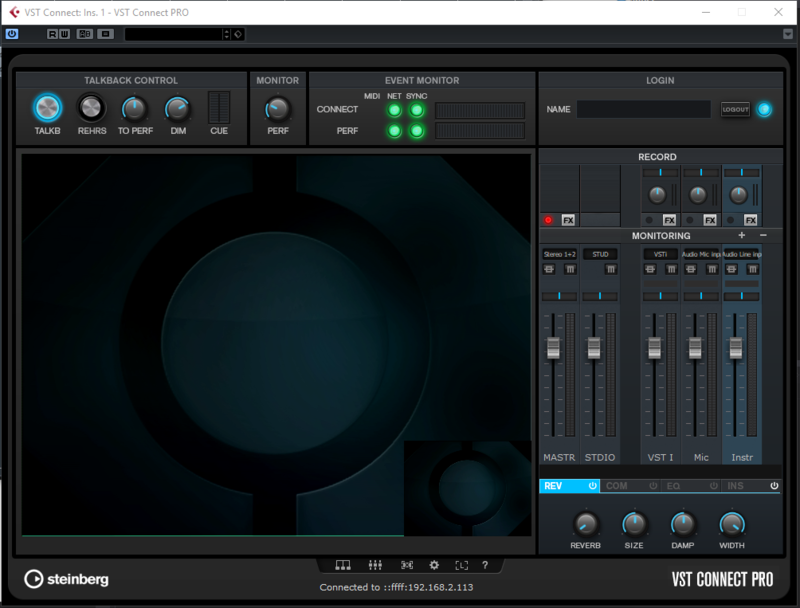 The Cue (VST Connect) channel has been created by the 'Create VST Connect' function. Leave it 'Not connected'; the VST Connect plugin grabs hold of this signal and sends it to the Performer. Again, the 'Route to Performer' is beeing discussed later. Of importance here is the 'Monitor 1' setting. Here, and only here should you assign your speaker outputs to the 'Device Port' column. Save the Studio to some preset (e.g. 'VST Connect') for later reference. Let's have a look at the Control Room (CR) Mixer to see why it is important to use the CR Monitor. Open it via menu Devices/Control Room. Click the 'Setup' Tab at the bottom right, and Ctrl/click the 'Main' section to have it look like this. Note the 'Main' section at the bottom. You can see the 'VST Connect Monitor' below the Main output. This allows the VST Connect plugin (VST Connect Input channel) to route its signal directly to and mix it with the Main output so to bypass all delay lines that would otherwise cause the Performers' signal to arrive at your speakers late (delayed). As explained later, in the project, make sure no Track Monitor is active on tracks fed by the VST Connect plugin; that Input Monitor signal is delayed significantly, and you should not want to use it. You want to hear the Performer only directly via the VST Connect Monitor plugin and not anywhere else. If you don't hear the performer, this plugin may be missing or switched off. Try 'Repair VST Connect'. Also make sure that the "MONITOR/PERF" dial on top of the VST Connect plugin (shown later) is cranked up. If you create a 'Phones' (or other) monitor channel in the VST Connections/Studio Tab mentioned above and use that for monitoring the Performer instead of this Main output, you may have to move the VST Connect Monitor plugin there instead. If you deal with your own Monitor channels, we assume that you know what you're doing and understand that concept by now (VST Connect Monitor plugin post extra Monitor or Phones output). Check this if Performer doesn't hear things as planned. That is, no harware ports should be assigned here. You may imagine the signal that the Performer sends to you is 'replacing' the hardware ports that you would assign otherwise if you wanted to record yourself. Like the Performer 'speaking into my mic'. In the Control Room picture above (Route from Performer), you also see the 'Cue (Vst Connect)' channel at the top. Make sure it looks like this and that the VST Connect Cue plugin is inserted. The signal generated and sent to the Performer is created via the Control Room Cue channel functionality. This is explained here and it all applies to both a 'local' studio situation and when recording via VST Connect. Many users have never recorded anybody but themselves with a DAW. In a recording studio, the engineer uses the Control Room Mixer to create a so called 'cue mix' (sometimes refered to as 'Aux' or 'Foldback', a term often used for the same purpose in a live monitoring situation). 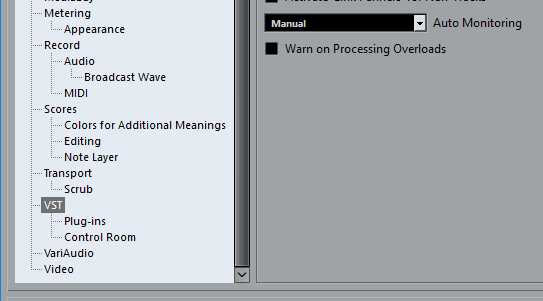 You may check the Cubase/Nuendo manual for more features of the Control Room. Right-click the 'Cue (Vst Connect)' header to see some options regarding Cue Mixes. Of course, the channel should be activated (blue button). The circular 'TB' button must be activated at all times and should be left so, even when Talkback is off, otherwise the Performer will never hear your talkback microphone. The default source is the mixer cue mix ('Cues' button). This is used to generate and send a dedicated mix of mixer channels to the Performer. Note the Control Room Mixer again, which can be configured to be visible in the main mixer window as well. 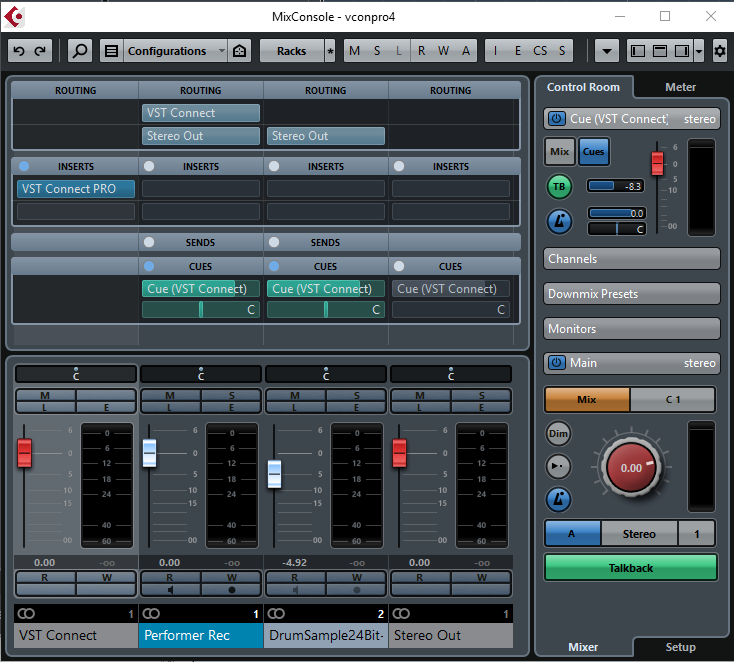 See the 'Cues' row in the middle of the mixer (use the 'Racks' item at the top of the 'Mix Console' window to activate its visibility if it doesn't show). The active (green) levels determine what the Performer hears when the Control Room 'Cue (Vst Connect)' channel is set to 'Cues' (blue button). This requires some thought; if the Performer complains not to hear certain tracks, make sure that they are sent via the 'Cues' send sliders. You should use the 'Create Performer Track' of the VST Connect menu, or 'Duplicate Track' in the arrangement to clone an existing Performer track in order to have this set up so that the Performer can hear his or her own performance when reviewing a take. Obviously, the Cues send has to be active; there is a tiny button at the left of each of the Cue send levels. There is also another tiny button to toggle pre/post fader mode: post fader (default) means that when you change a channels' fader (here, the white handles), the cue send signal will also be changed accordingly. To prevent that, pre fader may be engaged for each Cue send individually, which makes the Cue send entirely independent from the studio mix. So this way, you can present an individual mixdown to the Performer. Alternatively, and if that all sounds like rocket science to you, just click the 'Mix' button (becomes orange) at the top of the Control Room 'Cue (Vst Connect)' channel instead. Now the Performer will hear what you hear. Set 'Auto Monitoring' to 'Manual'. If the Performer can hear the music but not your voice, there is something wrong with your Talkback settings. First, as noted before, you must have your Talkback (TB) microphone assigned to the Control Room Talkback channel. When you 'Create VST Connect', this has been offered to choose, so make sure there is a Talkback Channel in the menu Devices/Control Room/Studio tab (see 'VST Connections' picture above) and that your TB mic is connected there. Then, Talkback must be enabled. VST Connect automatically switches off (disables) TB during playback and recording. The reasoning here is that your talking during playback or recording is not in sync (delayed) for the Performer to hear, so it would only confuse him or her. You may choose to use 'Rehearse' mode described later, but not for recording (there is no 'jamming' mode in VST Connect). You can see the green 'Talkback' button at the bottom of the Control Room mixer above, indicating that TB is active. When you speak, you should see the meters of the Control Room 'Cues (Vst Connect)' channel move. That meter shows everything that the Performer hears (also visible in the VST Connect plugin discussed later) and actually corresponds to the VST Connect Monitor Mixer 'STDIO' channel. Finally, as mentioned before, the circular 'TB' button in the Cues Channel must also be activated. If your TB mic still doesn't cause the Cues meter to move, double check your hardware and Vst Connections Studio tab settings. Here's a tip...you may have to manually switch Talkback often, in that case you may want to assign a keyboard shortcut (like 't') via File/KeyCommands', 'Control Room/Talkback on/off'. 'REHRS' - rehearsal mode. In this mode, you must not record, as recordings would not be in sync with the playback. This is just to coach the Performer during playback. In rehearsal mode, Performer usually just listens, because if he or she performs along with what he or she hears, it will not be synchronous on the studio side. When rehearsal mode is off, Talkback is automatically switched off during playback or record to avoid confusion due to the delay between studio and Performer. 'TO PERF' - corresponds to the Control Room 'Cue (Vst Connect)' level. 'DIM' - if you listen to the Performer via speakers instead of headphones (the latter beeing recommended so to avoid the Performer to hear his or her voice with an echo), there is the 'Dim' function in the Control Room which dims (lowers) the main Monitor output so to avoid feedback. The 'DIM' knob is connected to the 'Talk Dim' level in the Control Room Mixer Main Monitor 'Mixer' section shown above. 'Cue' - linked to Control Room 'Cue (Vst Connect)' meters. You can see what the Performer hears here. 'PERF' - this determines how much you hear of the Performers' signal via the VST Connect Monitor plugin discussed above. rehearse button does. Keep in mind however that there is a long delay (as set by the Remote Latency parameter) which can be quite confusing. So for instance when you sing along to what you hear it will be significantly out of sync for the Performer. Thus, usually you will want to leave everything as it is (Rehearsal off). - Studio hits start. Appearently, nothing happens on the Studio side for as long as the Remote Latency setting allows (one second default). - in fact, during this time, Cubase/Nuendo has started to "play back" internally, providing the cuemix stream to the Performer. As such, you are right to say that Remote Latency is a crucial setting. But the bargraphs are there to help; each shows 1/2 second of time, and the bar indicates how much is available (at 50%, 0.25 sec audio are available). So, the Remote latency setting is the first one to look at when there are dropouts. When you record somebody next door like in a standard audio recording situation - which hasn't changed for more than 80 years now - you will find a studio equipped with a Control Room and related technology on the desk, even in the early days of broadcast. There you find that you have to provide a cuemix and talkback to the performer, and the Cubase and Nuendo Control Room is a great addition that enables you to fully control this recording workflow. you do and it has a lot of great possibilities, but if global routing is changed, things can certainly go wrong. About Cue Sends: If you add a new audio (or fx/group) track, the cue send is not initially activated, so you may have to do that. But there are some nice convenience functions in the cue channel itself (remember it's in the Control Room Mixer). enable/disable/reset cue sends, set them all to a specific level, or apply faders and pans etc. You don't have to "create" cue sends, because of the Control Room CueMix's existence, there is a cue send for each mixer channel automatically. Performer to hear, then right click the Cue (VST Connect) channel in the Control Room Mixer and select "Use current mix levels"
in the "From selected channels" submenu, and the Performer will hear those channels like you hear your mix. If he or she then wants the guitar a bit lower and vocals a bit more, you use the cue sends of those channels to adjust his or her headphone mix. - Master: set the Performer's hardware output (headphones) here. The interface device is set up in the settings. The Master fader controls the overall Performer Monitor volume. - Studio: the return from the studio. Obviously, no port can be assigned here (fixed to "STDIO"). - VSTi: same here, this is fixed to the output of a VST Instrument, should one have been set up (pls. refer to the manual). - Mic, Instr: set the Performer hardware input ports. This can be any audio input available. Please note that the one thing that can't be set remotely is the input gain of the hardware interface, as there is no standard way to do so. The Performer needs to set up the according input gain manually, you may guide him or her reading respective levels. With the PRO version, up to 14 additional audio input channels may be added. The same rules apply as with the mic/instr. channels. Note that all those faders merely control what the Performer hears; none of them have any influence on recording, neither local, nor remote. The next row features two buttons, enable inserts and mute. You set up inserts in the lower section "Ins" tab which also features a global enable button for all (up to four) insert effects. Further down is a tiny slider which controls the amount of reverb (as configured in the "Reverb" tab in the lower section) for each channel separately. Note that compression, reverb, and eq (also below per channel) are local to the Performer, these effects are not beeing recorded. As for insert fx, see recording below. Then there are pan, and faders. The very bottom denotes the channel Names, Input channel names can be edited (double-click). Above the Performer Monitor resides the Recording section. This controls the stereo recording on the Studio side. Note that HD recording in the PRO version is not affected by any of the Performer Monitor or this recording section, with the notable exception of the stereo mix. All separate channels are recorded directly from the hardware inputs. - the Master channel is always recorded (stereo mix). - the dials control each channel's level in the stereo recording. - small horizontal faders control the stereo position (pan) of each channels contribution. You may set these hard left/right in the SE version and later separate to two mono tracks if you want to record for instance a singer and guitar played at the same time. With the PRO version you may just get the HD files later which are automatically assigned separate tracks then. - record buttons enable or disable recording to the stereo mix (and local HD recordings I guess). So you might want to record only the instrument channel but not the mic channel if that is used only for communication. - finally, the "FX" buttons allow to set for each channel whether or not the cahnnel's inserts should be recorded or not. When disabled, the Performer will still hear the insert effects so to improve his or her listening experience, yet the signal is recorded without those effects. Here are some things to be aware of when using VST Connect. - use an 'Empty' project and 'Create VST Connect'. This should just work. - don't try to solve problems blindly poking around everywhere. If you do nevertheless, make sure to revert changes that you made which didn't lead to success. An accidently changed item may cause problems not covered by the 'Repair VST Connect'. - dropouts: increase 'Remote Latency' in the VST Connect plugin settings (cogwheel). - not a jamming tool! - sample rate: in case of a sample rate mismatch, the Studio sends a request to the Performer to adjust it. Some Audio Interface can not change the sample rate programatically; in that rare case, the studio will repeatedly get a warning and has to advise the Performer to set the sample rate to that of the studio, or, alternatively, the studio may change its project sample rate instead (make sure to save the project beforehand). - do not activate 'Constrain Delay Compensation' - it will disable VCON. But make sure to have no latency plugs in the signal path. - additional firewall application (router firewall, user installed firewall): allow UDP. Usually, there is no need to mess with firewall settings, port forwarding or the like. This applies only when you have special firewall or router settings or software. - multiple 'Cue (VST Connect)' (or other) cue channels may have accidently been created. Just delete all but one of them. The VST Connec Cue channel can not be created if there are too many cue channels already. - You might try to delete VST Connect preferences (assuming Windows on C:) C:\Users\<me>\AppData\Roaming\Steinberg and there, any of the VST Connect .ini files that apply. - The iOS "Studio Pass" app works only with "VST Connect Pro". - Plugins with latency in the Control Room (or some other places) might well cause problems with syncing. 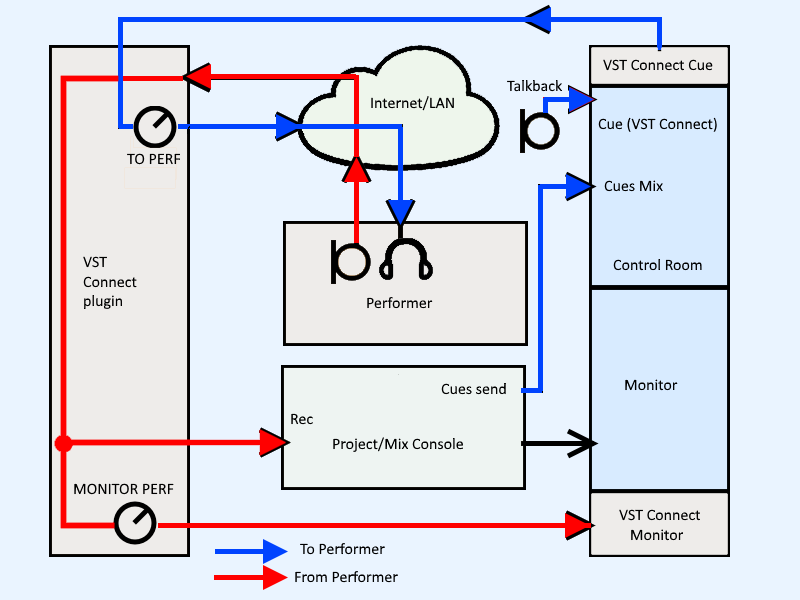 VST Connect sends playback ahead of time to the Performer and compensates for the remote delay. If other plugs with delay are in either path (cue send, return from Performer, or monitoring Performer) this certainly breaks synchronisation. - You can get mono if you create a Mono VST Connect Input channel instead of the default stereo one. So you may go to Devices/VST Connections/Inputs, delete the VST Connect Input channel, create a new Mono Input Channel and insert the VST Connect plugin there. - If Performer uses direct monitoring, you can simply mute his own channels in the Performer Monitor, only drawback is you can't use built-in Performer fx properly then. If you have suggestions to improve this help page, drop a note on the Steinberg forum here.